The DMI Sports model number of FT500GF is also called the Apollo and is a combination of luxury and fun. It offers Goal Flex technology that features an electronic scoreboard that allows both players to view the score at all times. This foosball game is action packed! Its other modern features mesh beautifully with its cherry finish to make this table the perfect combination of a good-looking, and great playing game. This would be a fabulous centerpiece to any recreational room. 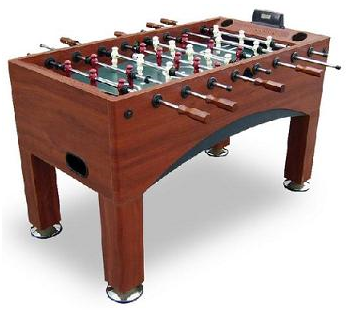 This foosball table is priced at around $560 US.